Using social share buttons in WordPress is almost a must have for search engine optimization and getting traffic for your website. Having a quick and easy way for your visitors to follow you on these social networks like Twitter, Facebook, StumbleUpon and Google+ is just as important. I have used several plugins to get this working and most of them do a great job. I used the Digg Digg Alternative as one of the more recent ones before I changed to Flare (more on that later on). It looks good as a floating sidebar and you can set the top and side offset to fit your theme layout. The reason fore using the alternative instead of the original Digg Digg plugin was based on performance in loading time. This plugin is widely used but it slowed down my site, doesn’t mean it will do the same with yours, still looks good. On the WordPress Plugin site is shown now as Shareaholic | share buttons & related content as it is now extended to show related posts as well. 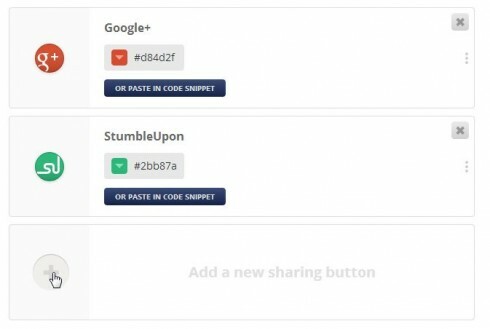 Earlier this week I was reading the Traffic Generation Cafe Blog and I saw this great looking, very slick share buttons. I was only when I scrolled down, this sidebar appeared with those share buttons. So I looked at the source code to find out what she was using to do this, and after a short investigation I found out it was a plugin called Flare. I switched over and removed all others I was using, so you can now see the plugin active on this website. Installing flare is a breeze, just go to Plugins -> Add New and search for Flare. Find it, install it and activate it, first steps done. Now you will find a new Menu option in you Dashboard called Flare, click on the Share option and set your options. 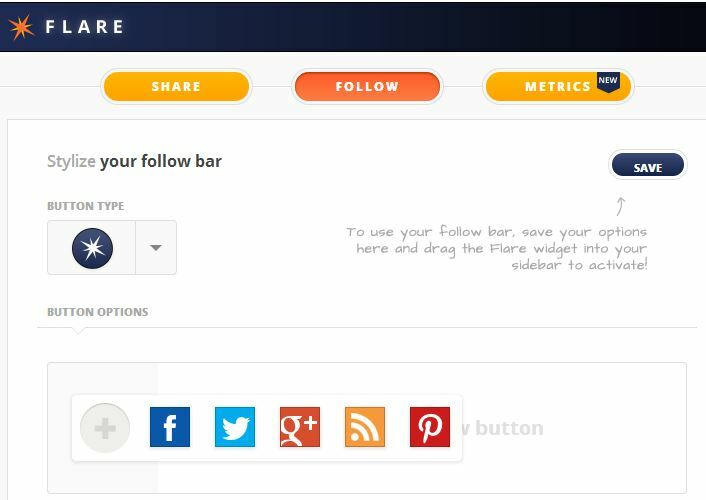 The first option you need to set is where your social share buttons and sidebar will appear on you website. I choose to show them on top, on bottom and floating, all left aligned to fit the theme layout. You can choose the button type, round, square, etc. 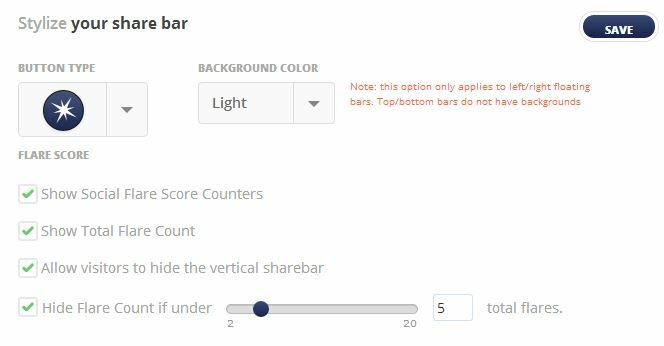 Choose what you want to show, like the counters of how many shares you got, when you want them to show up and if you want your visitors to have the possibility to close the sidebar. Upon fist installation you only see Twitter and Facebook buttons, click the big + button to add more. Last thing you need to do is decided when you want these social share buttons to be shown, on posts is standard. For this site with a lot of pages I also want them to show up on pages. Save it all and check if it works as expected. If you are done with the Social Share Buttons, you can start with the widget and configure the follow me options. Got to Flare and choose Follow, it should show you a screen like this one. Again follow the instructions and push the plus button for more. Configure your settings with things like your Twitter user name, your Google+ profile, your Facebook profile page and every other thing you want to show. Once you get all the options done and saved, go to the widgets (Appearance -> Widgets) and place it on your sidebar. I have set it up with a bigger then standard icon and with more spacing. I like the cleanliness of the layout and all the options it gave me. How about you? What is your favorite WordPress social sharing buttons plugin and why? Update: How to remove the purple new Flare plugin button. The new version of the Flare plugin shows you a purple button that brings you to the site of the plugin authors. Many people, me included, don’t like this new button. It might be a good idea to promote your work and get lots of inbound links, but if you cannot choose to opt-out of that link, that is a bad thing. There is a way though to hide the buttons and icons. With the new version (1.2.4) you now have the option to hide the purple button by deselecting the Show Love checkbox! Thank You http://www.dtelepathy.com/ for listening to and acting upon your plugin users request! I don’t see a big plus button on the page. What am I doing wrong? It could also be you have a problem with other plugins you use on your WordPress site. If the above don’t work, try to disable the other plugins and active only Flare (just for testing!). @Herbert-Jan van Dinther Thank you so much. It was, in fact, just so light I couldn’t see it. I added the other options. Is there any way to get an RSS button on the same array? @Linda: Glad I could help! As for the RSS feed bottom, you can have that on the Follow widget. All the other options in the share bar are really for sharing content, RSS feeds are there so people can follow you. I have those Follow me stuff in the sidebar, just above the mail menu. @Linda, I just finished a post on how to Customize WordPress Twenty Eleven Theme. It might be helpful for you as you also use the Twenty Eleven Theme. Thanks for this post. I was just looking to find some social share buttons. I use Shareaholic but It is giving me problems. The like button does not show up. So I am giving up on it. I am going to try Flare. Does not sound too complicated to set up. I like the mobility offered by Flare with the size adjustment etc. Not bad and highly recommended. Do I need to mention that it is so easy to set up? How do you get the Flare share using Square buttons? There is no such option in mine. Do you have the Pro version? I’m finally ready to add social share buttons to my blog, and Flare sounds pretty good. I’ll give it a try. One question though: I notice that the row of buttons at the top of your page seems to be getting some sort of interference. When I hover over the ones in the row at the bottom, they’re “speech bubbles” pop up above them with the counter inside, all fully visible. But when I hover over the ones in the top row, those speech bubbles are overlapped by something white above them, and I only see their bottom third. Does this have something to do with my own settings? I’m on Safari. @Lisa: There is no Instagram button in Flare. You can have a look at http://premium.wpmudev.org/blog/12-instagram-plugins-for-wordpress-worth-installing/ to seen what would be suitbale for you. @Daily: Look like you already found that the plugin has a Printerest option. For those still looking, just click on the + button in the share settings.